Water is one of the most valuable and scarcest of resources in the world. Better education and planning, along with advanced treatment techniques and developments of new technology are the absolute minimum requirements needed to provide clean water. Waste water treatment plants can be extremely large in size and can geographically cover hundreds of acres of land. A wastewater treatment plant covers several different process areas that include bar screens, grit chambers, multiple clarifiers, aeration tanks, bio solids, and disinfection. After water leaves the waste water treatment plant, it can be used for ground water replenishment, irrigation or further treatment at a water purification plant for human consumption. The control and management of this water is a complex task requiring thousands of measurement devices to provide constant data to various locations. Because of the large quantity of devices and the standardization that IEEE compliant devices offer, Ethernet is used as the communication standard around the plant site. A reliable Ethernet network within the waste water treatment plant is required in order to receive and provide constant and accurate data. Equipment redundancy is required for all steps within the water treatment process. The same should be done with the communication network and can be by utilizing a redundant network topology such as STP, RSTP or ERPS G.8032 standards. 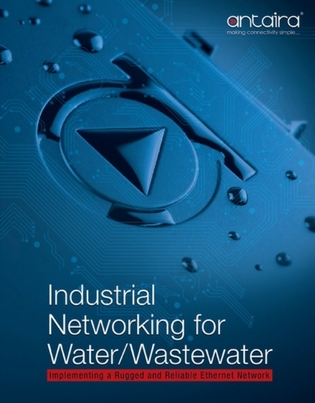 Adopting an Ethernet network gives water treatment plants an efficient data collection and management infrastructure for seamless upgrades and future expansion that is required for today’s growing cities. High-speed fiber backbones can not only help utilities to collect data from remote locations within the water treatment plant but fiber optic cable is also immune to electric noise from large equipment and power generation found in many areas of plant site. As treatment plants continue to upgrade, serial communication equipment or measurement equipment that require a serial connection are still being utilized. Serial device servers can be utilized to convert this serial data to Ethernet data, therefore allowing treatment plants to utilize their older equipment but still connect to the network. Water is without a doubt the most precious resource in the world. Monitoring of the nation’s water transportation infrastructure is of vital importance for consumption, food production and power generation. Due to the massive and rugged geographical areas water pipelines traverse, direct human inspection of this water transportation system is challenging. Therefore, equipment such as flow meters, pressure gauges, vibration and moisture detectors are utilized for monitoring of our water supply. Monitoring stations placed along the water pipeline can provide remote access and surveying of larger geographical areas by fewer individuals. Data received from the monitoring equipment in the field can allow for better allocation of maintenance and service personnel. With more real-time information at the disposal of the command center team the whole system is able to operate more efficiently with less downtime. Maintenance and troubleshooting of pumping stations can be challenging and time consuming as these premises are classified as confined space and often located in remote areas. 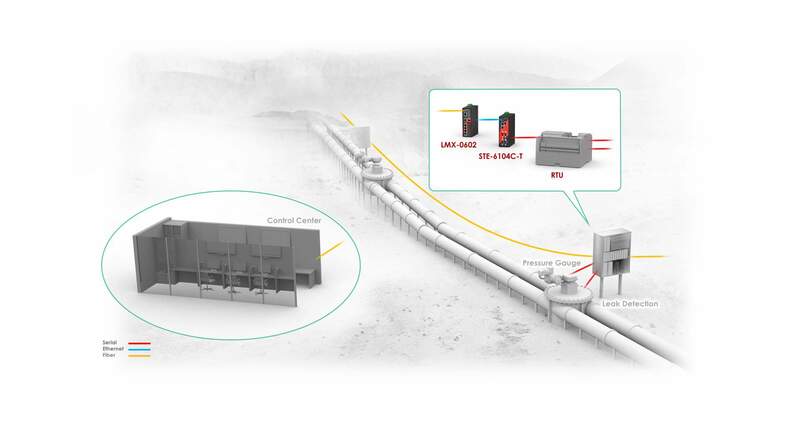 A rugged industrial Ethernet device networking solution setup is critical in order to efficiently monitor and control the remote pump station’s water flow, pressure levels and potential leak issues in real time. Industrial networking equipment can also provide built-in advanced event handling software features to report alarms in real-time via text message or email, and immediately notify on call technicians as well as any of the customer’s staff of emergency and non-emergency occurrences. In the past, local service engineers were called out to visit unmanned pumping stations to check the status and determine if any problems had occurred. 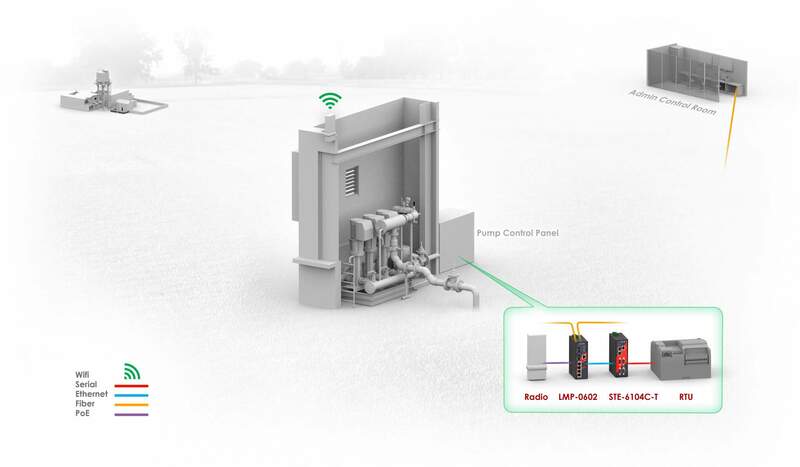 By implementing an industrial device network to a remote pumping station, the control system status can be read and analyzed before sending a service engineer to investigate. Dams require an extensive amount of monitoring and control data that provide critical information to keep things running efficiently and reliably. 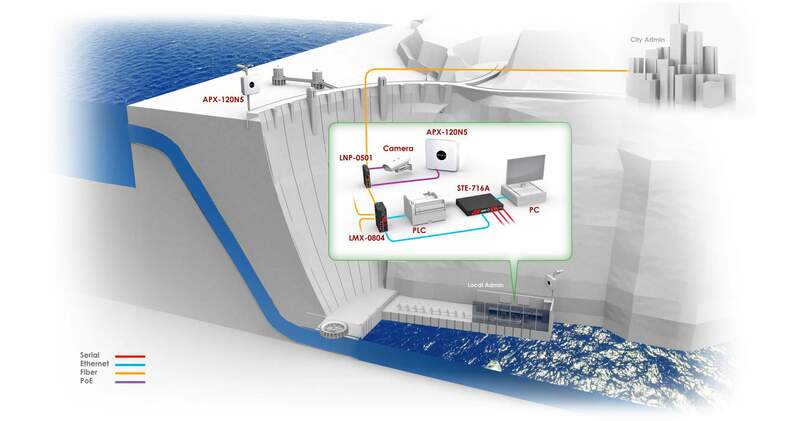 Monitoring is performed for both security and safety reasons around the outside perimeter, input channel, spillway and inside the dam itself. The local administration center is responsible for collecting, monitoring and controlling information related to water intake, distribution and even power generation in hydroelectric dams. The equipment that provides information to the control center can have different communication mediums such as serial, Ethernet, fiber optics or wireless. Due to the average age of dam infrastructures, it is not unusual for serial equipment to still be found. However, it is imperative that data communication be resistant to electronic noise interference generated from large motors, turbines and power. Fiber optic cables are immune to electronic noise and are an ideal solution in providing fast, reliable uninterrupted data communication. Fiber optics are also ideal for providing long distance communication to off sight administration centers.